Look at a map of the Pacific Ocean and follow a line southwest of Hawaii. Right after crossing the International Date Line, but just before crossing the equator sits the Republic of the Marshall Islands. What could possibly be a map maker’s accidental green spots in the vast pool of blue representing the Pacific Ocean, many have never heard of these tiny islands which are home to fantastic underwater treasures. The Marshall Islands, particularly Kwajalein Atoll, played a large role in the Pacific Theater of World War II and what was left behind in one of the Earth’s largest atoll will keep any diver entertained for many dives. Phantom Maru wreck. Photo by Brandi Mueller. The Marshall Islands consist of 29 atolls with a total land mass around 180 square kilometers (70 sq. miles), (about the size of Seattle), but the atolls cover over 750,000 square miles of ocean (think the size of Mexico.) Anyone looking at this region of the Pacific would guess the diving would be pretty amazing and it doesn’t disappoint. 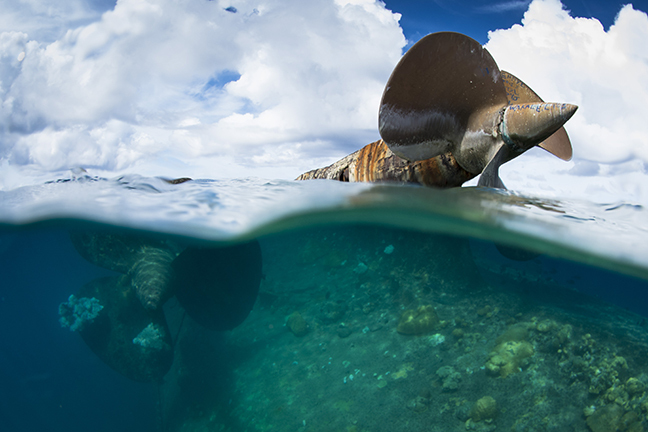 Healthy reefs, plenty of fish, and a lagoon filled with WWII shipwrecks, airplanes, discarded military supplies, and even a ship that almost survived two nuclear bombs. Welcome to Kwajalein Atoll. Kwajalein Atoll was an important base for the Japanese Imperial Navy that had been awarded to them after Germany’s defeat in WWI. During WWII, in retribution for Pearl Harbor, United States forces attacked in 1943 and 1944. Many divers know all about Operation Hailstone which took place in Truk Lagoon, because it gave us some of the best tropical wreck diving in the world. But less know about Operation Flintlock, a campaign in January and February of 1944 prior to that in Truk. This battle was also devastating to the Japanese Imperial Navy, leaving more than twelve large wrecks sunk as well as several airplanes and much military surplus underwater. Prior to Operation Flintlock, air raids had already sunk and damaged cargo ships, and light cruisers around both Roi-Namur and Kwajalein islands. Starting on 29 January 1945, islands to the northeast of the atoll were attacked, including Roi-Namur. Smaller islands were captured in the following days. Kwajalein was bombarded at the southern tip of the atoll. The attack came by air and sea, and media reported that more than 1,600 tons of ammunition was expended upon Kwajalein over 24 hours, which equates to at least three shells or bombs hitting the island every second. The islands of Kwajalein and Roi-Namur, as well as others, were leveled to the ground with hardly a tree left standing. 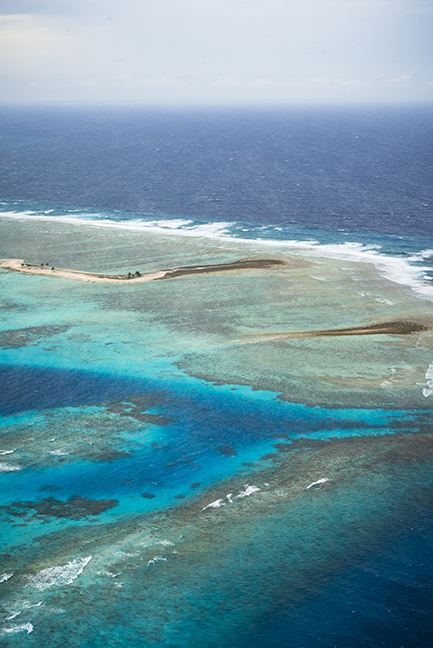 Many ships and planes were sent to the bottom of one of the world’s largest lagoons. 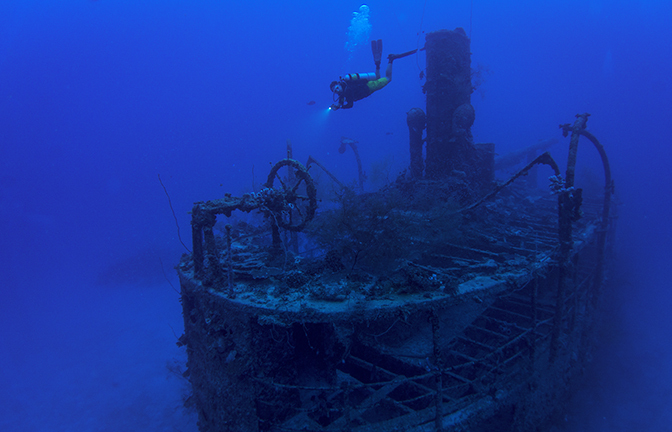 Almost 75 years later, those wrecks have been reborn underwater. Today, they are covered in colorful corals and sponges, the bow guns have tiny blue damselfishes living in them, and green sea turtles find refuge on the crossbeams of kingposts. 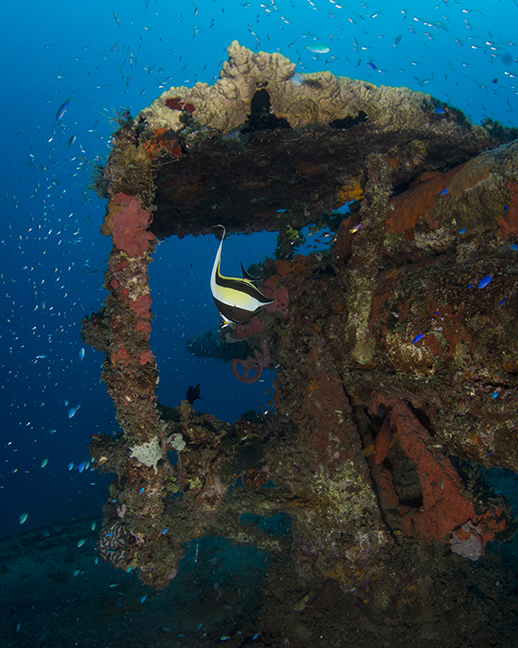 Nutrient rich, warm tropical waters have led to marine life flourishing on these historical wrecks from the past. The attacks on Kwajalein started in December 1943 with Operation Flintlock starting 29 January 1945. In December, several ships were sank, including the Asakazi Maru, Choko Maru and Shoyei Maru. The Asakazi and Choko were both attacked on December 4 and the Shoyei Maru on December 19. Asakazi Maru. The Asakazi Maru, called K-5 Upright by local divers because it is sitting upright and because of its close proximity to a Coast Guard buoy labeled K-5, is a popular wreck with a resident green sea turtle usually seen sleeping in one of the kingposts. It is thought that three 1,000lb bombs hit the vessel and it was reported to have sunk in less than five hours. The damage from the bombs can be easily seen underwater as the entire superstructure lay in a heap. Recent storms have also caused more damage to the ship. There is a 3-inch bow gun on a turret and a machine gun on the starboard side of the wheelhouse. Popular artifacts to see in the holds include sake bottles and the outer section of a small car. The ship is 73m (424ft) and the top deck sits at about 30m (100ft). Nurse sharks are often seen resting on the top deck and eagle rays frequently swim past divers. Choko Maru. 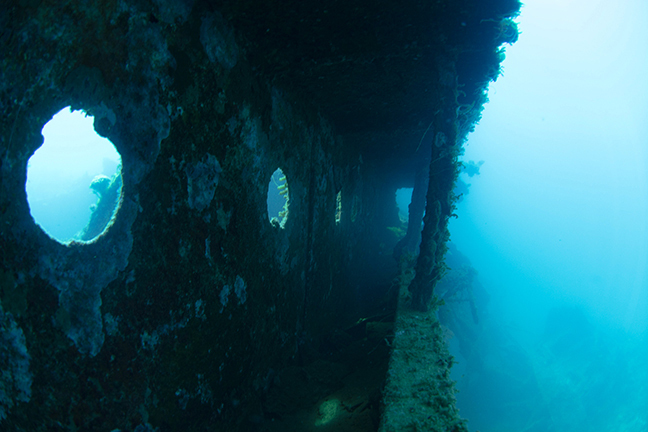 Also sunk on December 4 was the Choko Maru, known as Barracuda Junction. Of course, once you name a wreck after an animal, you never see that animal there again. In lieu of barracuda, the wreck does have several lionfish that live in the cargo holds as well as black coral on one of the kingposts with resident longnose hawkfish. The 103m (340ft) ship is sitting on its port side in 44m (145ft) of water. A 3-inch deck gun on a platform at the bow points towards the surface at a very photogenic angle. Turtles and eagle rays are common visitors and the stern has bomb damage. Two kingposts rest in the sand and many pipes can be seen, having fallen out of the holds onto the seafloor. Shoyei Maru. The Shoyei Maru (or possibly Syoei Maru) was sunk by a glide bombing attack on 19 December 1943. The ship lies upside down at 42m (140ft). Next to the ship is a F1M2 Pete which may have been on the deck of the plane when it sank. Akibasan Maru. The Akibasan Maru, known as P-buoy, is one of my favorite wrecks. Sitting upright in about 49m (160ft), this 115m (375ft) long ship is a fantastic dive. Having arrived just two days earlier from Truk Lagoon, the ship received three direct hits on 31 January 1944 from a single-engine plane and was reported to have sunk in less than five minutes. Today, the ship is home to a timid school of barracuda and some very friendly batfish that insist on following divers around throughout their dive. The ship has two kingposts that are around 20m (60ft) and a large smoke stack with a pretty anemone most divers visit on each dive. The smoke stack also has the insignia markings of Mitsui Bussan Kaisha, the ship’s merchant owner. The holds of the Akibasan Maru are fantastic with many exciting artifacts. In hold #2, there are seaplane wings and pontoons with kanji characters, previously thought to be meant for Mavis seaplanes, although they were recently shown to actually be for E14Y1 Glen floatplanes. Other holds contain Japanese beer bottles, sake bottles and shoe soles. Tateyama Maru. 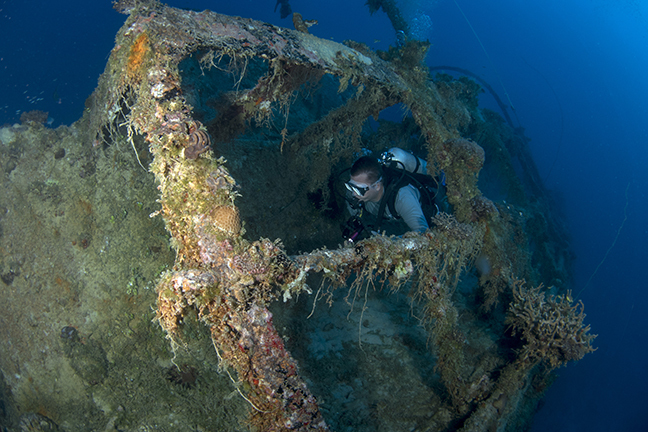 The Tateyama Maru (K5-side) is another favorite of the Kwaj diving community. This 103m (340ft) ship sits on its starboard side at about 42m (140ft) in the sand. A pretty pink anemone sits on the top rail with several anemonefish and cleaner shrimp. Schools of trevally are a common sight, as are friendly batfish. The sponge covering a lot of this ship is bright red when you put a light to it and the hull is covered in huge purple elephant ear sponges that are often shading sleeping green sea turtles. The ship was likely a converted water carrier bringing supplies to Kwajalein and was probably sunk by one or more 1,000lb bombs. Phantom Maru. Heading north, away from the island of Kwajalein, several ships can be found closer to the island of Ebeye and even further towards Bigei. The Phantom Maru, so named because divers kept finding it and losing it and finding it again, is an unknown Japanese wreck only about 30m (100ft) long sitting upright at 45m (150ft). There is a machine gun at the bow and the superstructure is mostly disintegrated except for the metal posts left behind. 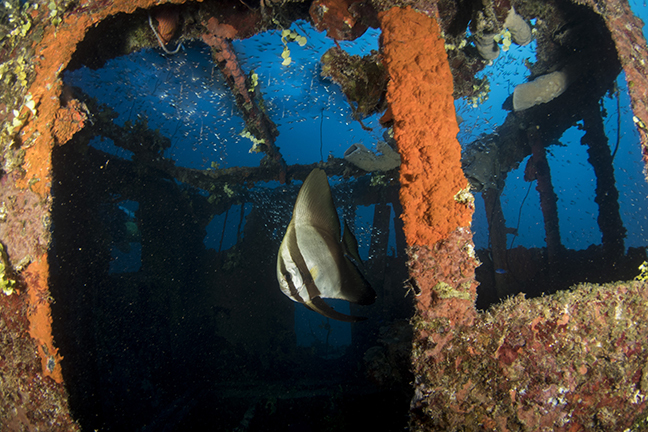 Divers usually see a large school of jacks when they descend to the wreck. Palawan. The Palawan rests just north of the island of Bigei. The wreck was a Philippines engine freighter that was captured by the Japanese and then used by the Imperial Navy. What was most likely a wooden ship now only has the skeleton of the structure left, making the ship look very ghostly. 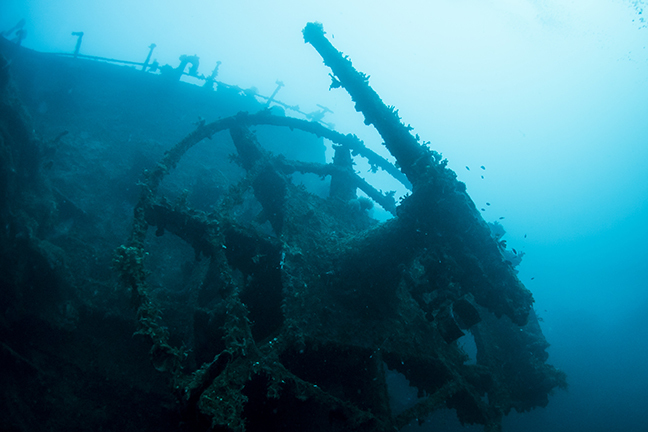 Divers love this wreck because it has a large wheel that is great for photos. 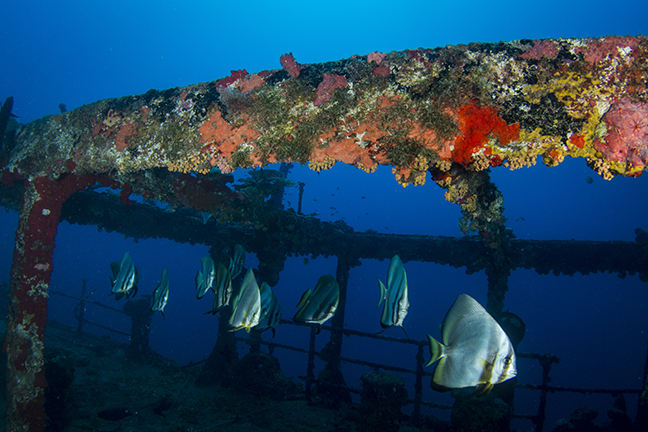 This ship has some of the best visibility of any of the wrecks because of a nearby pass that brings clean water from the oceanside into the lagoon. The ship sits upright in 45m (160ft) and is known for its huge black coral bushes that swarm with fish and are home to longnose hawkfish. 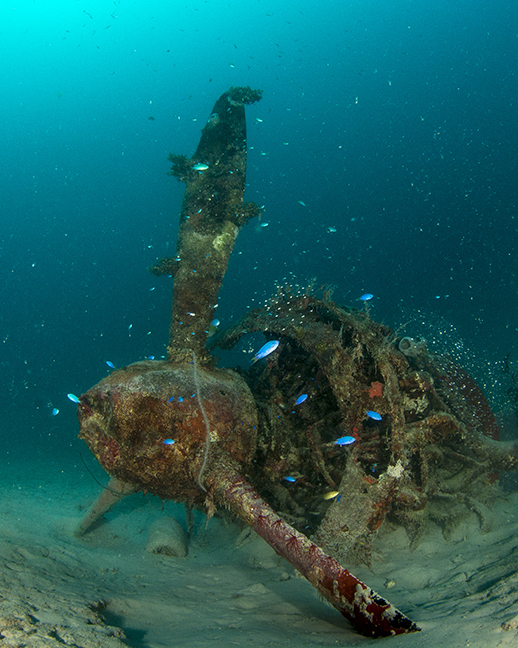 There are several other ship and plane wrecks that can be found in the lagoon of Kwajalein. Other vessels include submarine chasers, concrete barges, harbor craft and planes, most of which are marked and divers only occasionally visit. Japanese airplanes that can be found in the lagoon near Kwajalein include an E13A1 Jake and two Kawanishi H6K Mavis planes. American planes near Kwajalein include the remains of an F6F-3 Hellcat, several PBM-3R 'Mariner', and a PB2Y-3 Coronado. 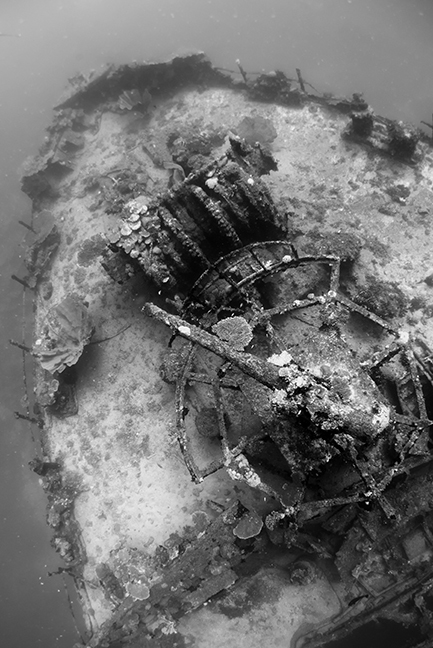 Many of these wrecks were found in the 1960s and 70s by divers working at the army base by dragging an anchor behind a boat until it snagged something. Luckily, these days, GPS coordinates make finding them a little easier. There is a good possibility there are other ships and airplanes that have not been marked yet. About 65km (40 miles) to the north of Kwajalein Island, sitting at the top right corner of the atoll, is Roi-Namur. Also used by the Japanese, there are three large ships that can be found just offshore in the lagoon. Known to local divers as first, second and third ship; they are all very interesting dives with plenty of marine life. Eiko Maru. The Eiko Maru (First ship) is thought to have been attacked but not sunk near Kwajalein Island and moved north where it later sank. The ship is not seen in images taken in December when the initial attacks on Roi occurred. This 104m (340ft) ship sits upright at 40m (130ft) in the sand with its two kingposts only being around 5m (15ft) deep. Schools of trevallies can be seen roaming all around the ship as well as zooming by the 3-inch bow gun that is usually also surrounded by tiny glass fish that make it look as if it is covered in glitter. Just off the bow is an American Landing Craft that can be seen from the ship on days with good visibility. Baby blacktip sharks are a common sight and they seem to come just close enough to check divers out and then disappear off into the distance. Kembu Maru. Not far from the Eiko Maru is the Kembu Maru (Second ship). This ship has a fantastic intact 5-inch bow gun that is the largest in the lagoon. Also upright, the ship is covered with marine life, including a large school of bright blue and vibrant yellow fusiliers that will pour down almost like rain on divers, only to switch direction and move upward and vanish into thin air. Huge moorish idols guard the bow gun and peacock groupers perch themselves in the many nooks and crannies. The bottom of the ship is in about 45m (150ft) of water and there is one kingpost that reaches up to around 20m (60ft). The top deck is around 28m (90ft). It is believed that the Kembu Maru was carrying aviation fuel; and after it was bombed, it was noted that there was a massive explosion and plenty of smoke. The results of this can be seen underwater as divers approach astern of midship. It looks as if the hull has been peeled back like an orange and the skin is flat on the ocean floor. Takunan Maru. Close to the others is the Takunan Maru (Third ship) which was a submarine chaser. Much smaller than the other two, it is only about 40m (130ft) long and sits on its side at about 40m (130ft). Most of the wooden hull and superstructure is gone. Nearby and also very close to shore is a mangled Japanese Zero aircraft. At the end of WWII, it was determined that excess war materials were no longer needed and that it would be more costly to transport supplies including aircraft, jeeps, and ammunitions back to the United States than to just dispose of it. About three miles southwest of Roi-Namur, starting just off Mellu Island, an estimated 120 to 150 American WWII planes and plane parts were dumped in the lagoon. 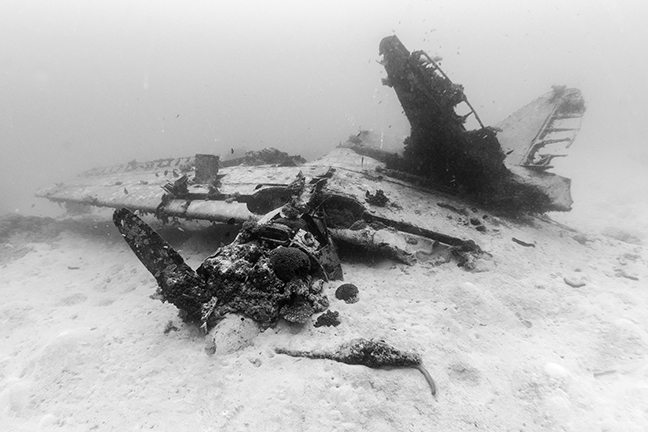 Local divers refer to this two-square mile area as the Airplane Graveyard and a dive in almost any part of this area will reveal several planes still in very good condition. The planes were stripped before being sunk and many have their props jammed into the cockpits. 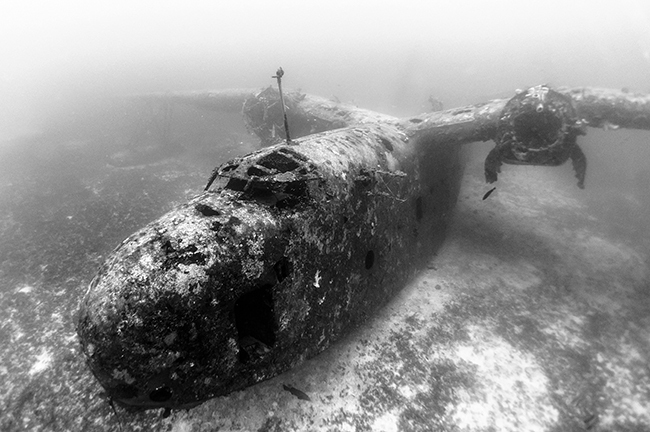 The planes can be seen in as shallow as 30ft of water to as deep as 130ft; and most lie in the sand with only a little coral surrounding the area. A nearby entrance to the lagoon feeds clear water into the area, giving it fantastic visibility. 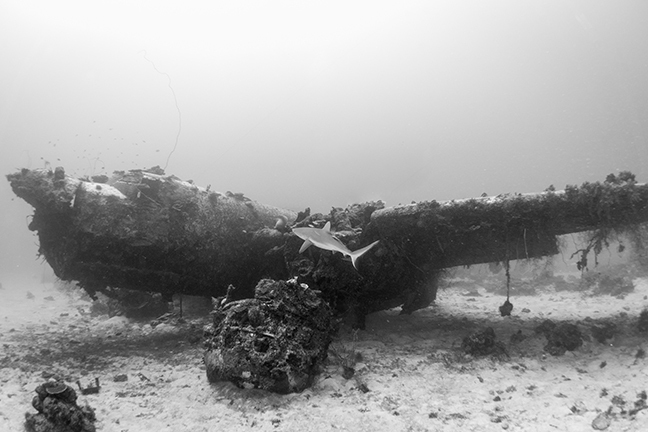 (Sometimes you can see the planes from the surface, even though they are 100ft deep.) The planes include Douglass Dauntless SBDs, Avengers, Wildcats, a Corsair, a Helldiver, Mitchells, and a Curtiss C-46 Commando. Some rest in the sand nose down, some upside down, others on top of one another and some sitting perfectly on their wheels looking as if they could take off at any moment. The Marshall Islands are also known for the nuclear testing at Bikini Atoll, about 350km (220 miles) from Kwajalein Atoll. In 1946, Operation Crossroads involved deploying three nuclear test weapons to study the effects of nuclear weapons and radioactive contamination. Only two tests occurred and the third was cancelled. Ninety-five ships were lined up in Bikini Atoll’s lagoon including the Prinz Eugen, a German ship that fought in European waters during WWII, and at the end of the war was transferred to the US Navy as a war prize. After WWII, the ship then made its way across the Atlantic to the United States, through the Panama Canal into the Pacific Ocean and finally arrived halfway around the world at Bikini Atoll to be used in the nuclear testing. The ship was one of only nine that survived both the Able and the Baker bombs, both Fat Man plutonium implosion-type nuclear weapons (the same that was dropped at Nagasaki). Being highly contaminated, the Prinz Eugen was towed back to Kwajalein Atoll to be further studied. Upon arriving in Kwajalein, a small leak in the hull was discovered, but the ship was too radioactive to allow anyone to go on board to repair it. It was in the process of being towed out of the lagoon to be sunk in the open ocean but it did not make it before sinking (still in the lagoon) next to the island of Enubuj (also known as Carlson Island). Today, the ship is mostly upside down on its starboard side with two propellers sitting out of the water. (The third propeller is in the German Naval Museum at Laboe.) The stern is shallow enough for snorkelers to swim along the huge propellers, both of which are partially exposed during low tide. The 207m (681ft) long ship rests on a sandy slope and the bow is in water about 36m (120ft) deep. Dive boats usually anchor close to the ship’s exposed propellers and start their dive swimming close to them and descending around the stern where several stingrays are known to reside. Looking underneath the ship, some of the crushed deck can be seen. Swimming along the starboard side and descending towards the bow, there are many windows and hatches to peek into, although everything inside has fallen from the floor to the ceiling, making it difficult to identify the interior. A popular place to view the ship is the torpedo room where there are at least six stacked torpedoes. The bow rests with the deck down but it is possible to swim underneath a part of it to the other side where grey reef sharks are often seen. Swimming back along the hull, divers can see that much marine life is growing on the hull including large elephant ear sponge (Ianthella basta). Often, several octopi can be found hiding in the crevasses of the hull and huge schools of parrotfish and tangs can be seen feeding on the growth. Several of Kwajalein Atoll’s islands are currently leased by the United States, including the southernmost island, Kwajalein, and Roi-Namur to the northeast. Visiting these islands is not permitted without special permission. There are no commercial dive operations on the atoll other than the Kwajalein Scuba Club which caters to personnel of the US Army Garrison Kwajalein Atoll. Several infrequent liveaboards pick up passengers at Ebeye Island (Kwajalein Atoll) to start trips to dive Bikini Atoll and dive a few sites on Kwajalein Atoll before continuing their journey. The Republic of the Marshall Islands is stated to be one of the first countries that will disappear if sea levels continue to rise. The highest points in the island are around 10 meters (30ft) above sea level, with much of the land very near sea level. Increases in the severity and frequency of large storms is currently causing extensive flooding which can be very damaging to housing, contaminate water supplies, and literally sweep people out to sea. Another rarely discussed potential issue Kwajalein Atoll has (as well as Chuuk/Truk Lagoon) is the possibility of a large oil spill in their lagoons. When the ships sank, they had varying amounts of fuel within them. As time goes on and the ships disintegrate, at some point, the oil and fuel would no longer be contained within. A particular problem is the Prinz Eugen which is known to have been almost fully fuelled when it sank. Divers see brown bubbles of oil coming from the wreck; and when there is little wind, an oil slick can often be seen coming from the ship. Each of these ships could possibly hold hundreds of thousands of gallons of fuel which would cause environmental havoc, especially for ships sunk in marine-rich areas such as Kwajalein Atoll. 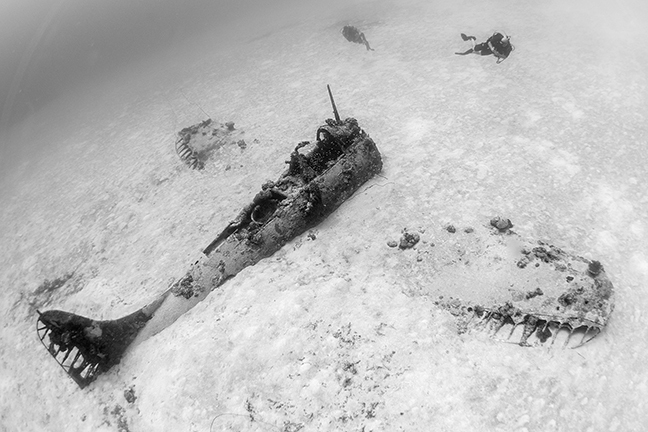 An interesting group of scuba divers, WWII historians, archaeologists, and dabblers in all of the above (including your journalist) have recently formed a group called the Kwajalein MIA Project. What started about ten years ago with just a few WWII aircraft fanatics searching for a missing Kingfisher plane that went down during WWII has grown into a nonprofit now using historical information, side-scan sonar, and a whole lot of luck. In August 2015, they found the tail section of a Coranado plane known as Gunga Din and it is likely associated with an MIA possibly in the front section of the plane that has yet to be found. This breakthrough find gave a lot of hope and expanded the search through historical documentation to find more on other planes with MIAs that went down in Kwajalein Atoll. This volunteer team has no paid staff members and runs on some fundraised support and on volunteers' out-of-pocket donations. There are at least 10 known aircraft with 12 missing-in-action service members within the Kwajalein Atoll lagoon and over 90 in the various atolls within the Marshall Islands unaccounted for; many have a probable chance of discovery using a side-scan sonar. The project is currently using a borrowed side-scan sonar which is only available a few weeks a year and they are currently fundraising to get their own which would allow for more time to search. 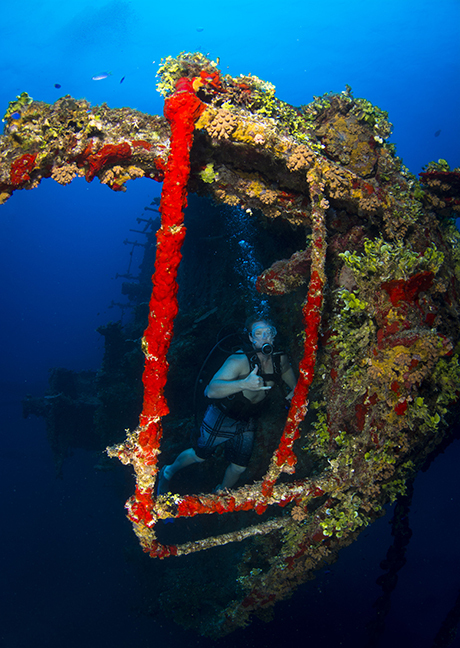 Brandi Mueller is a PADI IDC Staff Instructor and boat captain living in the Marshall Islands. When she’s not teaching scuba or driving boats, she’s most happy traveling and being underwater with a camera. For more information, visit: Brandiunderwater.com.